I am sending you to-day under seperate cover a picture of a little trophy that the citizens of Fort Worth got up for me and presented to me - its the first think in my life I ever had presented to me and upon receiving it it kinda knocked me out and I didn’t know what to say or what to do, it was a great surprise to me but now its getting to be quite an old picture and I am resting very easy over it. I have been well but the last 10 days have had a great deal of trouble with my eye - with pains in it and over it I can’t hardly touch one side of my face without a keen pain from my eye but nothing serious I hope. I guess you see from the paper’s reports how Broadway and Kilkerry are training for the Derby it looks like they are doing as good as any body’s horses. Just a steady gain not much but every little helps you know and I hope that we will have a fair chance to be in the money on the Derby. I am depending on Pete Walls to ride Broadway Limited, haven’t any rider as yet for Kilkerry but am writing Mr. Vestal to-day to be sure and get the right kind of a rider for him and go to work right now. 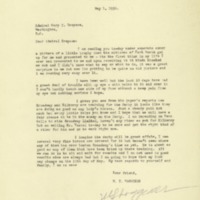 Waggoner, William Thomas (1852–1934), “WT Waggoner to Cary T. Grayson,” 1930 May 1, WWP16668, Cary T. Grayson Papers, Woodrow Wilson Presidential Library & Museum, Staunton, Virginia.